Although the Defense Contract Auditing Agency (DCAA) does not profess, endorse, or back any software products, there are products available to make sure that your dealings with the DCAA are pleasant ones. QuickBooks is a great option for DCAA accounting. For start-up companies the purchasing of software can get pricey, but when dealing with government contracts, the monies can be recouped. 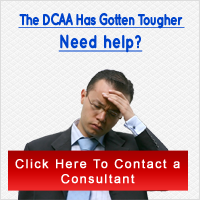 Now, do not worry, the costs are not completely unaffordable economically, but being without a DCAA compliant software program can get real expensive and overwhelming. If your answer is anywhere close to, â€œNo, my system does not do all of the aboveâ€ orâ€ Yes, but it takes a real long time and man hours;â€ then QuickBooks for DCAA accounting is a viable option. Nevertheless, do not get too excited just yet, you need a third-party to make QuickBooks software compliant. For your first contract, your use of QuickBooks will cut the mustard during the DCAA Accounting System review; this is especially true if the program has been optimized. However, as your company grows and you start collected more contracts you will have to adjust into a more powerful software program like Microsoft Dynamics NAV.